I wanted to send out an end of year newsletter that would include a short recap of my projects and activities in 2012, and to let you know what is on tap for 2013! This past year was largely defined by my partnership with public health organization Partners In Health, and I spent much of the year in Haiti. Over the last 12 months, I worked with a team of Haitian artists, who I trained in mosaic techniques, to create a wonderful series of architectural mosaics for Partners In Health's newly built Mirebalais Hospital in Mirebalais, Haiti. Phase One of the project included the creation of a large mosaic mural and mosaic pavement inset in the entry of the hospital, and a seating area outside the Community Health waiting area. Here is a cool story from PIH website about these projects. Phase Two included an epic project which covers the Pediatric Ward and attached Children's Playroom with colorful mosaics inspired by children's drawings. Over 100 artists contributed to this project by making mosaic stars, birds, butterflies and fish for different areas of the ward and playroom. 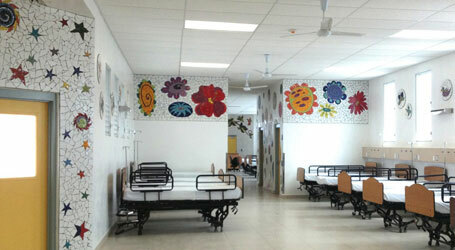 Almost 80 drawings by Haitian and American schoolchildren were used in the project, which included 12 mosaic murals, two entryway surrounds, two exit surrounds, a hallway connecting two sections of the ward and over 50 mosaic birds and butterflies floating up in between the beds and windows. I am so proud of my Haitian Ekip (Team) and so grateful to all the artists who participated with us! These projects were funded through community-driven fundraising...Amazing! A heartfelt THANK YOU to all those who participated in designing, making, funding, promoting, blogging about and otherwise supporting these projects! A very special thank you to Seattle Mosaic Arts for their significant contributions to the project, to Heath Ceramics for donating much of the tile and to Ecole de Choix and Sunnyside Schools and art teachers Blondel Joseph and Lois Keller for facilitating the children's drawing sessions. 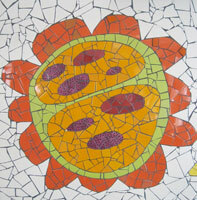 See more images on the Mosaics for Mirebalais Hospital Facebook page. One of the legacies of this project was the creation of the Mirebalais Mosaic Collective, made up of the guys I trained during these projects. Through their new collective we have begun to create commissioned projects for clients in the United States and in Haiti! Since much of my public art practice has largely taken on a community-based approach, I decided to continue this work under the auspices of The Global Mosaic Project. The Global Mosaic Project partners with other organizations and businesses for various projects which bring art education, entrepreneurial training and neighborhood beautification to communities around the globe. My aim is to get public art out into the world, especially in developing and urban areas, and to foster creative expression through cross-cultural, community-based projects and programs. The Global Mosaic Project has been BUSY this past year! Check out my previous blog post for a visual recap of these cool projects. 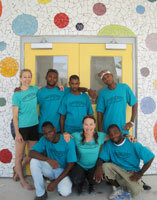 In addition to the projects at Mirebalais Hospital, Global Mosaic Projects were also created for the New Orleans Healing Center, Dalton School, Brooklyn Community School, Seattle Mosaic Arts, Timkatec Orphanage in partnership with Sow A Seed in Haiti, multiple projects with Art Creation Foundation For Children in Jacmel and more. I have been working with Art Creation Foundation For Children in Haiti on a project called Mosaique Jacmel, an ongoing project which has involves the creation of large-scale mosaic murals throughout the city of Jacmel. Through my role as lead consultant and project facilitator for Mosaique Jacmel, I have continued to train youth in mosaic techniques, offer professional development training and create new programs for craft development and product design. New programs in 2013 for The Global Mosaic Project include the development of the Studio Program at ACFFC, focusing on entrepreneurial training for young adults transitioning into the workforce. We are actively fundraising for many of these projects! To support the Global Mosaic Project's 2013 programs and projects, please consider an end-of-year donation. Here is a convenient link to DONATE through our fiscal sponsor, Fractured Altas. Check out the Global Mosaic Project Facebook page. The Global Mosaic Project will be partnering with several sustainable tour companies in the upcoming year to host destination community mosaic projects in locations around the globe. 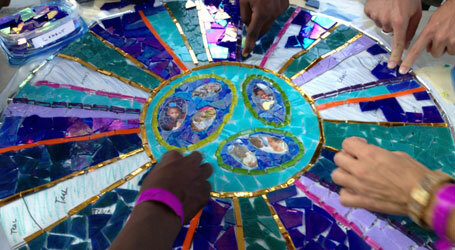 Combining mosaic making and voluntourism, Global Mosaic Project Tours offer a chance for participants to contribute to the enhancement of the visual landscape of our world through the creation of community-based public art. This past year True Mosaics Studio created commissioned projects for Gregangelo's Velocity Circus in San Francisco, ABC Veterinary Clinic in San Ramon, CA and several private commissions. I am currently working on designs for a mosaic mural at Ochsner Children's Hospital in New Orleans in collaboration with ceramic artist Jan Bear. 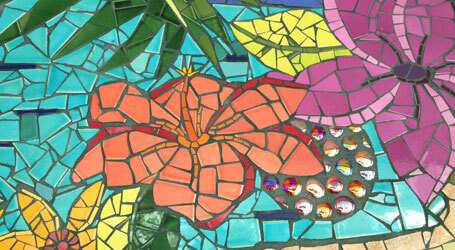 I offer educational programming in mosaic techniques and offer professional development seminars both nationally and internationally. You can keep up to date on my evolving teaching schedule on my Blog and on the True Mosaic Studio Facebook page. My Etsy Store is up! 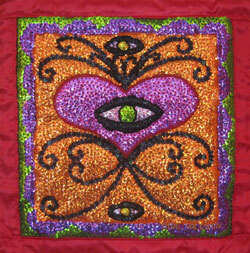 Sequin wall hangings made in Haiti by Valentine Valris, designed by Laurel True and cute African fabric aprons made in Ghana by Vickie Dzeklov. To sign up for my mailing list and receive occasional newsletters, opt-in here. Copyright © 2013 True Mosaics Studio, All rights reserved.